Revenue Use: 1936 issue 1d, 6d. Rarity Scale: 1936 issue 1d R4, 6d R4. 1927 issue 1d(pos 4), 6d, 1/-(pos 4), 2/6d. 1927 issue 1d R3, 6d R4, 1/- R4, 2/6d R4. Background: *George Eastman started experimenting with photographic technology in the late 1870’s and formed the Eastman Dry Plate Company in London in 1881. Eastman pioneered film on rolls and this revolutionised the photography industry. The business grew quickly to become Eastman Kodak Company by 1892 with a web of related companies in the United States, Canada and throughout Europe. Kodak Australasia was formed in 1908 by the merger of Kodak with the Victorian based Baker and Rouse Pty Ltd who had operated the Austral Plate Company since 1884. The Kodak production facilities were located at Abbottsford in Melbourne but they operated retail and distribution offices in Sydney, Brisbane and Adelaide. 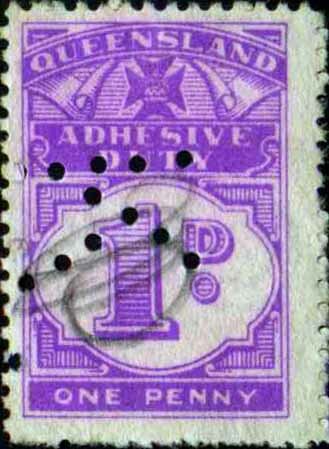 Notably Baker and Rouse were also perfin users with a B&R pattern found on postage stamps between 1906 and 1910 but this pattern has not been found on revenues to date. 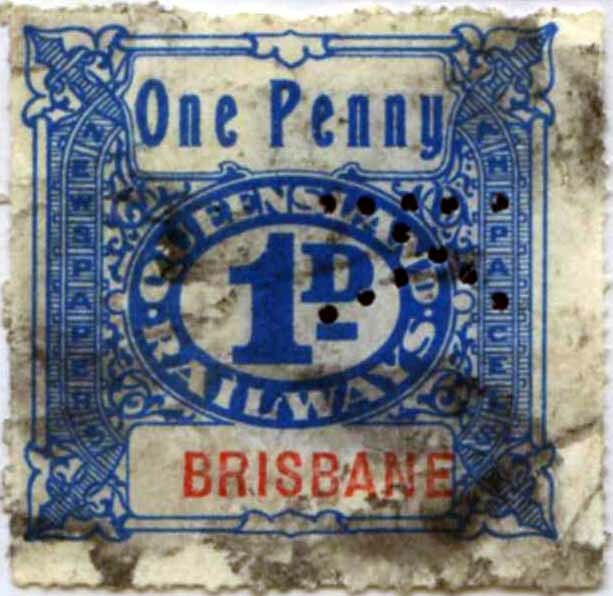 Device: This Brisbane device was a single head device as it is able to produce central strikes on stamps of all sizes. It is found used on both revenue and railway stamps as well as postage stamps. Usage spans from c1919 until at least 1953. The pattern is characterised by thick pins which generally give a clear strike. It was a robust device and the pattern is complete until late in its use although very late use (1953) does show incomplete strikes.